A brave recovery in the deciding seventh game but for Slovakia’s Lubomir Pistej, it was defeat in the penultimate round of the Men’s Singles event at the 2018 ITTF Challenge Belgosstrakh Belarus Open in Minsk. The no.4 seed, on the early afternoon of Sunday 18th November, he was beaten in seven games by China’s Zhao Zihao (8-11, 11-3, 9-11, 11-6, 11-4, 9-11, 11-9), as players whose journey had started five days earlier in the qualification tournament enjoyed success. In the previous semi-final, Japan’s Shunsuke Togami had accounted for Romania’s Cristian Pletea, the no.23 seed (15-13, 11-3, 11-8, 12-10). It was a most spirited effort from Lubomir Pistej who, earlier in the year in the first week of April, had been the runner up at the 2018 ITTF Challenge Slovenia Open, beaten by Japan’s Mizuki Oikawa. After the first four games had been shared, it appeared that Zhao Zihao, a right handed pen-holder, was seizing control. He won the fifth game and led 5-4 in the sixth; Lubomir Pistej called “Time Out”; after, with neither player was able to assert authority, at 10-9 Lubomir Pistej held game point, the chance was seized, a deciding seventh game beckoned. Once again Zhao Zihao appeared to be in control of matters, at the change of ends, he held a healthy 5-1 lead. Lubomir Pistej reduced the deficit to three points at 6-3; Zhao Zihao elected for “Time Out”. At 8-4 he held a clear advantage but won only one of the next six points as Lubomir Pistej mounted a determined recovery. Matters level at 9-all, little international experience but to his credit, Zhao Zihao did not panic; as has happened so many times in the past where Chinese players are concerned, the technique remained firm and in the rallies he was the more secure. The next two points went his way, a place in the final was realized. Somewhat differently, for Shunsuke Togami, there was no tense deciding game. A close opening game, proved the key to the contest, the verdict went in favour Shunsuke Togami; at the end of the game, having incurred the wrath of the umpire by throwing his racket on the table, eventually finishing on the floor, Cristian Pletea was never mentally in tune in the second. Conversely Shunsuke Togami was ever more focused and increasingly confident. In the second game Shunsuke Togami established a 5-1 and never looked back; in the third he went ahead 4-2, Cristian Pletea called “Time Out”, he levelled at 8-all but the next three points went to his adversary, the writing was on the wall. The fourth game was close but Shunsuke Togami being three games to the good, had breathing space; Cristian Pletea fought for the cause but his opponent held the aces. 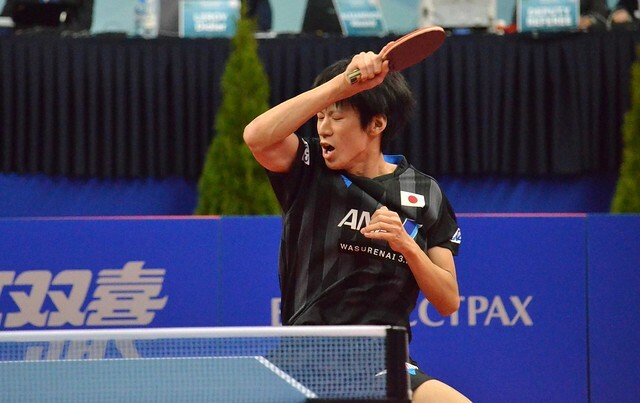 Success for Shunsuke Togami and success for the second time; at the 2017 ITTF Challenge Croatia Open in Zagreb, he had beaten Cristian Pletea in three straight games in their second round encounter, the contest being very similar to today in Minsk, a close first game and then seize control (13-11, 11-4, 11-6). The final will be played later in the day.